Whether you are a small startup or lead a seasoned corporation, sooner or later you’re going to ponder the practicality of owning your own office space, factory or other commercial property. Like buying a house, the decision to buy your commercial property as opposed to paying rent is tough and one that should not be entered into lightly or without the help of a mortgage professional. Major corporations like McDonald’s have always made purchasing the properties where they build their restaurants a priority even in their earliest days. They realized that there was more money to be made in leasing their properties to their franchisees than there was in selling a Big Mac with fries. 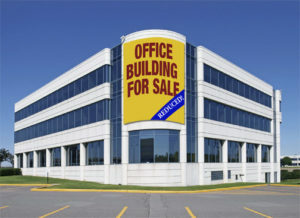 Commercial real estate is a long-term asset and a great investment. Over time, commercial real estate increases in value and builds equity for the owner. This is especially important for a growing business because a simple refinance could provide much-needed funding for growth and might cost you less than getting a traditional business loan. Another upside is that you will also be paying down the principle on your own dream instead of helping finance your landlord’s retirement. And remember that eventually, you won’t have a mortgage. This reason alone has pushed more business owners to invest in owner-occupied commercial real estate space. Owning your own Commercial property gives your company more stability. No more negotiating rent increases and leases is a huge perk when it comes to owning your own commercial real estate. Owning your own property means not having the stress and instability of yearly rent increases which can be as much as 3%-5% a year. You unhook your monthly payment from the commercial rental market with a fixed monthly payment as long as you stay in the space. Owning Commercial Real Estate has built-in tax benefits. And when you multiply these expenses by an average corporate tax rate of 35%, there can actually be significant tax dollars saved. You can become a Landlord and let someone else help you pay for YOUR dream. Depending on the size of your property and your industry, it is likely that you won’t use the entire property. In fact, some loans only have an occupancy requirement of 51%. So, a savvy business owner could purchase more real estate than they need and offset the mortgage expense by dividing the other 49% into office or warehouse spaces to rent. You make the rules. If you want to paint pink elephants on the walls you can because you are in charge. As your business changes and evolves, you will appreciate the freedom of being able to redecorate, remodel or reconfigure space as you see fit, without needing anyone’s permission. You can finance your own retirement. Over the last 10 years, the U.S. Commercial Property Price Index has increased by about 26.2%. When you eventually sell your commercial property, you will earn capital gains equal to the difference between the purchase price and whatever the current fair market value is at that time. So, before you put pen to paper and sign a lease, consider the benefits of owning your own commercial property. You will be glad you did.